My real estate career began in 2014 where I was employed as a Property Managers Assistant. I was then promoted to Property Manager after completing my Property Management Registration course. I have worked in Busselton, Perth metropolitan area and Albany and have a strong knowledge of the local market here in Albany as I grew up on the Southern Coast. 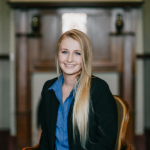 I am employed as a Property Managers Assistant at Merrifield Real Estate and I am passionate about achieving the best results for our owners and tenants. Real Estate is where my heart is and I love that not every day is the same. Thanks for your time and professionalism, you have left a great impression of both yourself and Merrifield Real Estate.